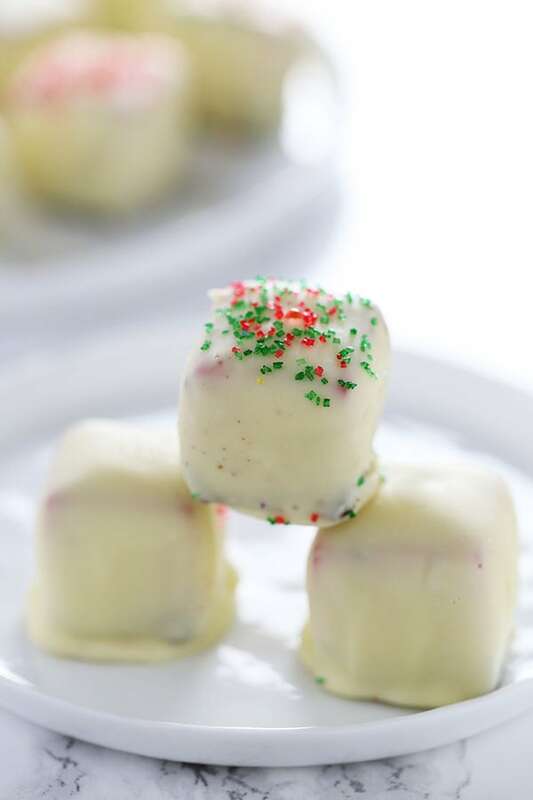 Red Velvet Cheesecake Bites feature squares of homemade red velvet cheesecake dipped in white chocolate and garnished with festive holiday sprinkles! Perfect Christmas treat. Taste: The combination of an Oreo crust, tangy red velvet cheesecake, and sweet white chocolate is just about perfect! Texture: Each bite is loaded with so many incredible crunchy, smooth, rich, and creamy textures. Ease: Making the cheesecake is easy, but coating the bites in chocolate is messy and hands on. Pros: Fun and festive homemade treat perfect for the holidays. You could also swap out the sprinkles to make these perfect for Valentine’s Day or the 4th of July! Cons: Coating in chocolate is time consuming, messy, and takes a few tries before they start to look pretty. If you want to avoid that, you could drizzle with chocolate instead. There are a handful of recipes that I’ve shared over the years that have become permanent favorites among you guys. 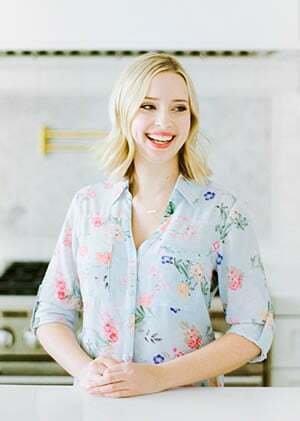 It doesn’t seem to matter where or when I share those recipes, they always get tons of likes, comments, and rave reviews. My recipe for Chocolate Covered Cheesecake Bites is one of those. I can see why. It basically takes an already indulgent dessert, cheesecake, and turns it into bite sized pieces of chocolate candy. What’s not to love? I knew this year I had to make a fun and festive version that could be adapted to different holidays. 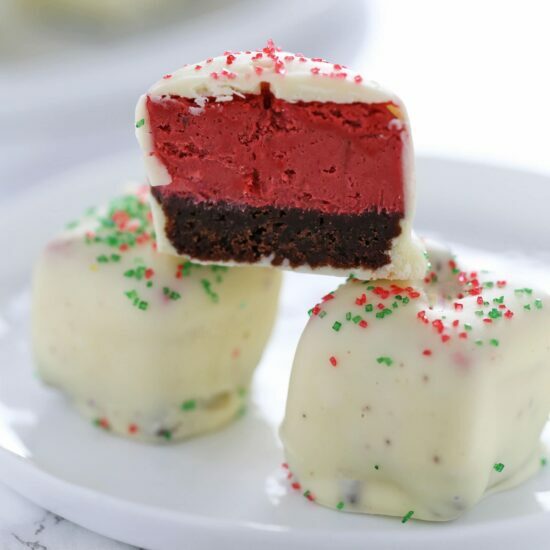 That’s how these Red Velvet Cheesecake Bites were born! I used green and red sprinkles to garnish these for a festive Christmas effect. However, depending on the time of the year, pink or heart shaped sprinkles would be perfect for Valentine’s day. Or even a drizzle of pink candy melts. For the 4th of July, blue sprinkles would be perfect! -Make sure your cream cheese has come completely to room temperature and you beat it until completely smooth. Otherwise you’ll end up with lumps in your batter that will look like white specks among the red cheesecake. -I like to use Americolor Gel food coloring for red velvet. It packs a colorful punch with just a few drops, so you’re not using a ton of food coloring and altering the taste of the recipe. Any gel food coloring will be better than liquid. -For easiest and cleanest chocolate coating, the cheesecake bites need to be completely frozen. If they start to warm up, pop them back in the freezer to solidify again. -The white chocolate coating calls for coconut oil. This helps to smooth out the chocolate so it’s easier to dip, and helps the chocolate to solidify once it’s cold. It doesn’t really add any coconut taste. You can also use shortening. -If garnishing with sprinkles, do so immediately after dipping in chocolate before it’s had a chance to set. Preheat oven to 350°F. Line an 8 by 8-inch square baking dish with foil and spray with non-stick cooking spray. In the bowl of a food processor, pulse the graham crackers until finely ground. Add the butter and pulse until moistened. Press mixture evenly into prepared pan. Bake for 10 minutes, or until light golden and fragrant. Reduce heat to 325°F. Using an electric mixer, beat the cream cheese and sugar until smooth and fluffy, about 3 minutes. On low speed, add in the sour cream, eggs, cocoa powder, food coloring, vanilla, flour, and salt and beat until just combined. Be careful not to overmix. Pour the batter over the crust and bake for 35 to 40 minutes, or until cheesecake is slightly puffed and center is set. If the center is slightly jiggly, that’s fine. Place parchment paper or a silicone baking mat on a baking sheet. Dip cheesecake squares, one at a time, in the melted chocolate. Let the excess drip off and place on prepared sheet. Immediately garnish with sprinkles, if using. Repeat for all the squares then refrigerate until the chocolate is set. Serve or store the squares in an airtight container in the fridge or freezer. I love Red Velvet, and these will be perfect for the holidays! I try to make something the same. I like this idea for Christmas. Hi, I’ve made your other chocolate covered cheesecake bites before and after dipping them, the chocolate cracked after it hardened. What can I do to avoid this? They still tasted good but didn’t look so pretty. I would say use a higher quality chocolate. Try a piece of baking chocolate that you chop up yourself instead of chocolate chips (if you were using those). I am going to make this for Christmas. But I was wondering what brand or kind of coconut oil was best to use. (or shortening) And I was also wondering if I needed to use white chocolate CHIPS. Because I just kind of started cooking, so I don’t about everything there is. I am going to make this for Christmas. But I was wondering what brand or kind of coconut oil was best to use. (or shortening)? And I was also wondering if I needed to use white chocolate CHIPS? Because I just kind of started cooking, so I don’t about everything there is.